Since a big part of the changes I have in store for Confessions of a DisNerd involve community and interaction, I felt this would be a great way to kick things off. I’m posting the picture of the challenge here; I lay no claim to being the inventor of the challenge, just an eager participant. Feel free to use it on your own Facebook walls, but I truly hope you will post and share here as well! Obviously here you won’t be able to post photos in the comment section, but as fellow DisNerds, I’m sure we’ll all know what each other is talking about. 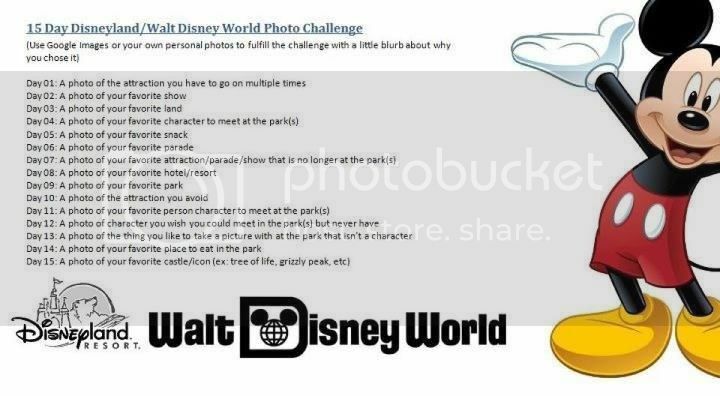 If you’re more familiar with Walt Disney World, feel free to talk about that here as well – or even combine the two! Tomorrow starts day one of the challenge: The attraction you have to go on multiple times. See you then!